Oh, I could lie about this whole thing and say that my boyfriend is out of town, but um, well that would be a lie and why lie to the internet? Not the same kind of joy as lying to your MOTHER about being a virgin, right? But anyway, since even Chloe didn’t want to be dragged along, I went out by meself, downed a Third Avenue Special Shrimp Tempura Wrapped in Spicy Tuna Roll and topped it off with coffee yogurt and coco chips from Berrywild, all the while checking my Blackberry like I was waiting for some important call. But since I was wearing sweats and an old baseball cap, I figured most people knew it was just a ruse and I was really, truly exactly what I appeared to be…alone at a sushi bar on Saturday night. 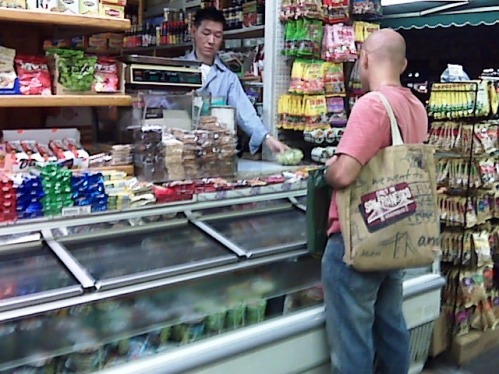 To top off the excitement, I went to the Korean deli next store to pick up a paper and found lots of other sad sacks and I figured, well, at least I’m not doing an entire food shopping at a Korean deli on Saturday night like this guy was. Anyway, I’m just here cause my boyfriend is out of town.